These make a perfect Halloween Trick or Treat. When melted remove from the heat. Place some parchment paper on a baking tray. 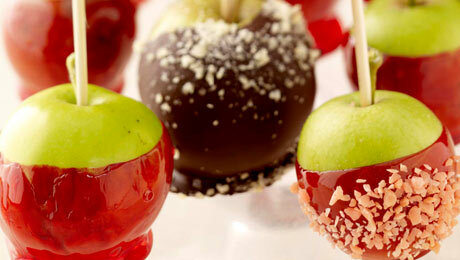 Tilt the bowl of chocolate to one side and swirl the apple through the chocolate to coat two thirds of the apple. Lift out and allow excess to drip back into the bowl. Sprinkle popping candy if desired for the extra pop. Place in fridge until chocolate has set. Place the sugar, water, and cream of tartar into a heavy based saucepan. Dissolve slowly then bring to the boil for approximately 5 minutes without allowing it to colour, keep the mixture transparent. To test the temperature is correct, dip a spoon into the caramel and remove onto parchment paper, it should set immediately, otherwise allow to cook for a further minute or two or when you are happy with the consistency. Add the food colouring and you are ready to coat the apples. Skewer the apples and tilt the pan of caramel to one side and swirl the apple through the caramel, covering the two thirds of the apple. Lift and allow excess to drain and place on the parchment lined baking tray. You can add your favourite sprinkles for extra colour i.e. white chocolate sprinkles, hundreds and thousands. Be extra cautious when making the caramel as it is extremely hot and could burn should it contact your skin.